Some readers of this blog may remember how in Pee Wee Herman’s Playhouse, there was always a secret word. When someone said this word, everyone jumped up and down, screamed, and ran around. The same sort of thing sometimes happens in sustainability metrics. Words such as “stranded assets” and “integrated reporting” take on extra weight and meaning that can be surprising to those of us who track the field. We support the group’s goal of encouraging corporations to study, understand, and attempt to integrate their sustainability goals with those laid out by the UN. The bulk of the SDG Commitment Report 100 discusses how a group of 100 companies has attempted to accomplish this. The UNGSII claims it will use existing assessment and measurement approaches as a starting point for its methodology. Unfortunately, it included in this first report a ranking of the 100 large companies, solely based on how often they mention the UN Sustainable Development Goals (UNSDGs) in their public statements and financial reports. Of the 100 companies studied, 18 didn’t mention the UN goals. As a result, they were ranked at the bottom of this new index. The top three positions went to Volvo, Novartis, and J. Sainsbury who mentioned the UNSDGs 360, 331, and 316 times, respectively. While all three of these firms are well-regarded for their sustainability performance, none of them were among the top ten scoring companies from this group, using CSRHub ratings. We believe CSRHub’s ratings are a fair estimate of the consensus perceived performance for the companies UNGSII studied. Our system has an average of 46 sources of information (and thousands of individual data points) for the 100 studied companies. 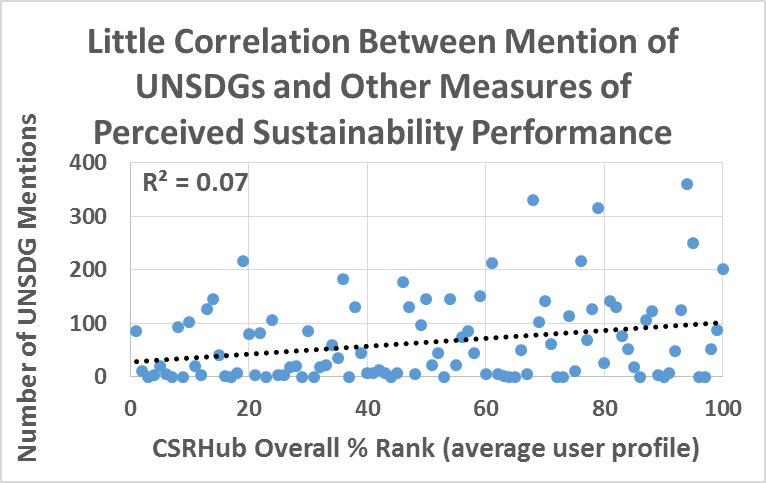 A simple regression of the number of mentions indicator used in the study against CSRHub’s overall percentile rank shows only a 7% correlation between mentions of the UNSDGs and consensus rank. We hope that sustainability managers who hear about this new index will realize that this approach to measuring their company’s sustainability performance is limited. They should not aspire to “win” next year’s iteration by packing their annual reports, financial filings, and sustainability reports with one or another phrase associated with the UNSDGs. Instead, it would make more sense to stay focused on provided balanced descriptions of a company’s efforts to improve society and the welfare of its stakeholders. Plus, next year’s “secret word” might be different—and any work to stick in extra versions of this year’s word could be wasted.